This week a paper from the EPIC-CVD which I co-authored was published in the European Heart Journal. Unfortunately the article was subsequently promoted in the press with the headline ‘Fat but fit’ still risk heart disease, encouraging a belief that physical activity offers no heart health benefit to those that are overweight. This headline is misleading because most people understand ‘fit’ to mean physically activity, however the paper didn’t measure physical fitness. Instead it measured metabolic health (ie, high blood pressure, cholesterol and blood glucose) which some term ‘medical fitness’, and is often shortened to ‘fitness’. Hence the confusion. To provide some context to these numbers, we know that having a heart attack is more common in older people – that risk increases with age by about 10% per year. 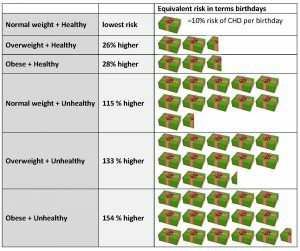 Being overweight and healthy notionally makes you 2 ½ years older (in terms of heart disease risk) than a normal weight and healthy person. Whilst being obese and unhealthy notionally makes you 15 ½ years older! My take home message from these figures is that having poor metabolic health is much worse than being overweight or obese on its own; however people carrying excess weight still don’t get off scot-free. So, if you can improve your metabolic health (whether you are normal weight or overweight or obese) you can substantially reduce your risk of CHD. Equally if you can reduce your weight (whether you have good or bad metabolic health) you can reduce the likelihood of a heart attack even further. What about being fit, ‘physically active’ fit? If you are overweight and are physically active then this will more than likely be good for your health – we know that physical activity has beneficial effects on metabolic health. The long-standing fat-fit hypothesis states that the health benefits of being physically active can cancel out the increased risk of being overweight, so it’s possible to live just as long if you are fat as long as you are fit. Does our work say anything about that idea? Not really, not without a lot of inference and assumptions. You’d need a study of physical fitness and weight and metabolic health to get to the bottom of that one (a study like this). What is apparent from this analysis is that grouping people based on continuous measures of health is spurious. If you look at the ‘apparently healthy’ overweight or obese group you’ll see that their blood pressure, cholesterol, blood glucose, etc are actually still higher than the supposedly equally healthy normal weight group. To me this suggests that metabolically healthy obesity doesn’t really exist, not long-term. The people in the healthy obese group just didn’t quite meet the cut-offs for being defined as ‘unhealthy’ yet, suggesting it’s only a matter of time before they cross over to the unhealthy group. So what’s the point of putting people in boxes, we are all individuals after all, with our own unique profile of risk factors. I’d say let’s try and keep continuous risk factors continuous and aim for lowering them across the whole range using whatever methods have been shown to work in the past. Physical activity and diet can both help in different ways, to either improve metabolic health or promote weight loss, so aiming for a healthier lifestyle is as important as it ever was. This blog was written by Dr Laura Johnson, a Lecturer in Public Health Nutrition in the Centre for Exercise, Nutrition and Health Science, School for Policy Studies. This entry was posted in Exercise, Nutrition and Health Sciences, School for Policy Studies and tagged coronary heart disease, EPIC-CVD, European Heart Journal, fat, fitness, Laura Johnson, metabolic health, overweight, physical activity by policystudies. Bookmark the permalink.